Duplex villa in the Alhambra Village, completed in 2006, with 1,509 SqFt living area under air condition. Free high-speed Internet and faster Wi-Fi access throughout the house. Large lanai overlooks a small lake. Just 100 feet to the clubhouse with heated swimming pool and lake view. Clubhouse equipped with flat screen TV, indoor and outdoor seating areas, kitchen and summer kitchen with BBQ. Master bedroom with king bed opens to the lanai. Generous master bath with double vanity, roman shower and walk-in closet.Guest Room 1: King bed, Guest Room 2: Queen bed. Guest bathroom with shower. Large, well-equipped kitchen with granite bar. Living room / dining area with sliding glass doors to your private lanai with views to the lake with all sorts of wildlife. Laundry room, double garage. kitchen with stainless steel appliances, refrigerator with icemaker, microwave, dishwasher, separate laundry room with washer and dryer. Bed linen, towels for bath. Dining table and long chairs on the lanai. High Speed Internet with WiFi. Come and see with your own eyes. beaches: Our peninsula will surprise you with a 40 mile white sandy beach with 3 islands just in front of it. Manasota Key, Palm Island and Boca Grande. It will not be difficult for you to find every day a new exciting space for your towel and your umbrella along the Gulf of Mexico.You will relax perfectly. (Englewood Beach, Manasota Beach, Venice Beach) Countless dolphines, water turtles and pelicans live here at our coast. Your are in close contact with the nature. The peninsula Cape Haze is one of the best treasured secrets on the coast of Western Florida. the Cape Haze Peninsula offers everything for an unforgettable Florida vacation, including: water sports, boat rentals, 15 golf courses within 20 minutes, great restaurants and bars, malls and shopping - and not to forget the 330 sunny days per year. The once only by fishermen populated area has worked its way high up in the popularity charts of Europeans with many new single-family homes and shops. Come and see with your own eyes! Climate/Weather/flights: 330 sunny days per year. You can almost always tip your hat to the end of another perfect day in Florida. The climate has always been Florida's most important natural resources, which is reflected in its official nickname, the 'Sunshine State.' Summers throughout the state are long, warm, and fairly humid. Winters are mild with periodic invasions of cool to occasionally cold air. In order to get there from Germany or Switzerland, we recommend: SWISS from Zurich to Miami and then with the rental car to VILLA Happy Days. The drive from Miami to VILLA Happy Days takes about 3 hours. LTU flies from Munich to Fort Myers. From the airport to VILLA Happy Days, you need to rent a car; approx. 1 hour drive. DELTA flies out of Zurich or Munich to Atlanta (daily), then connecting flight to Tampa. The drive by car to the Happy Days VILLA from Tampa airport takes about 1 1/2 hour. more info: Southwest Florida extends along the Gulf Coast from Sarasota / Bradenton in the north to Naples / Marco Island in the south. Approximately in the middle of this magnificent coast, lies the Cape Haze Peninsula with Englewood, Rotonda, Placida and Boca Grande. This part of the Gulf Coast is the largest 'little secret' and you're all invited to enjoy what we have to offer. Our 3 offshore islands await you with a total of 40 miles of white sandy beaches. A paradise for nature lovers: Whether you do a morning walk along the beach, glide thru Lemon Bay in a kayak, collect shells, watch the game of the dolphins or enjoy the unforgettable sunsets - Southwest Florida is a paradise for nature lovers. Charlotte Harbor, Peace River and Myakka River have always been a paradise for fishermen and nature lovers, who prefer the loneliness of nature to the bustle of the big tourist resorts. The City Mall in Port Charlotte with its 100 shops and exciting boutiques is about 15 minutes away. Free high-speed Internet and faster Wi-Fi access throughout the house. 3 bedroom / 2 ½ baths / for 2-5 persons Duplex villa in the Alhambra Village, completed in 2006, with 1,509 SqFt living area under air condition. Large lanai overlooks a small lake with exciting Wildlife. Master bedroom with king bed opens to the lanai. Generous master bath with double vanity, roman shower and walk-in closet. Guest Room 1: King bed, Guest Room 2: Queen bed. Guest bathroom with shower. Large, well-equipped kitchen with granite bar. Living room / dining area with sliding glass doors to your private lanai with views to the lake with all sorts of wildlife. Laundry room, double garage. Amenities: High Speed Internet mit WiFi, 4 TVs, stereo, telephone, air-conditioning throughout the house, fully equipped granite kitchen with stainless steel appliances, refrigerator with icemaker, microwave, dishwasher, separate laundry room with washer and dryer. Bed linen, towels for bath and pool. Dining table and long chairs on the lanai. Community Pool - Club House. We had an absolute wonderful time. The place is extremely clean and well cared for. I owned a cleaning company for many years and this place by far is the cleanest rental I've been in. Villa Happy Days was just like a home away from home, very clean and well maintained, everything you need, the wifi is excellent, a short drive to the beach, with Publix and Walmart nearby, all in all a very comfortable home! We will be back !!! Happy days house is very quite, clean and with all you can imagine for a wonderful stay in Florida and beaches (umbrella, bikes, internet access,). I have never seen a such incredible kitchen for a vacation rental. Everything is very high quality, new. The owner and manager are very professional.It's the best place to discover the "real Florida": Englewood beach are only at 10 mn from the House. Es freut uns sehr, dass sich unsere Gäste im Happy Days auch nach 5 Jahren Vermietung immer noch sehr wohl fühlen. Wir sind stets bemüht, unser Haus in einem Top Zustand anbieten zu können. Dies gelingt uns auch dank unserer pflichtbewussten und zuverlässigen Betreuerin vor Ort. We just came back from our winter vacation at the Villa Happy Days. We had a wonderful time. Its a very nice villa, large, comfortable,clean, very well equiped and organized. There was a lot of informations in the villa and Esther, our agent. was very welcoming, available to answer our questions and a good guide for restaurants and activities. Relaxing time in a typical old Florida town. We were very pleased with our holiday in this semi-detached villa. Everything was as described in the ad and the photos do not do it justice. The villa was very clean and welcoming, and the contact person on site was very helpful and friendly and suggested some interesting things to do and nice places to eat. We did not do everything, we have two teenage kids, we spent time on the beach, the water was really warm and the beaches are not crowded and mostly safe for younger children(there is a lifeguard at the public beaches)or, we lazed around the pool. We saw wild dolphins but we didn't see any manatees, although next time I'm sure we will. We went fishing, horseriding,walking, shopping,cycling and had we wanted to, could have played loads of golf, tennis etc,because everything is never far away.. This is a typical "old Florida Town" the people are very friendly, I would say its not a place for young people looking to go clubbing,or in search of "adventure" although maybe the alligators.....but if you have children its a safe ,relaxing place to be. 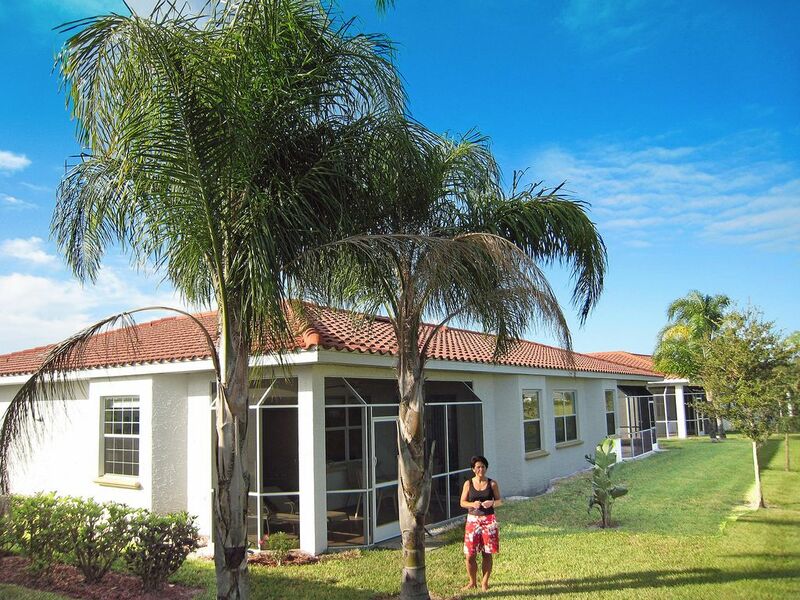 The villa is comfortable, well equiped (my adolescent kids appreciated the high speed internet connection) and Orlando is a 2hour 15min drive with all the theme parks etc and Miami 3hours away. The contact with the owner was very good and the booking went very smoothly. Trying to be objective, there is no "sea view" from the villa as it is not on the beach, it's beside a lake, and car rental is an absolute must as all the amenities, beach etc are nearby (10 to 15mins) if you drive. (supermarkets are 5mins away).I also have to say that the town is not exactly "jumping" in the evening,but, relaxing and watching the famous florida sunset around some of the excellent sea-food dishes in a nice restaurant is not bad either. All in all we really enjoyed it and would go back ourselves, and highly recommend it to families and older people. Wir haben 2 wunderschöne Wochen in diesem Haus verlebt und können eine uneingeschränkte Empfehlung aussprechen. The Cape Haze Peninsula with Englewood, Rotonda, Placida, Bocca Grande, is the last touristic untouched coastline of Southwest Florida. 'This is how Florida used to be' - rave our visitors. With 3 Keys and a total of 40 miles of pristine sandy beaches, it offers the beach lovers the longest coastline on Florida’s west coast for. They invite for sunbathing and swimming or you can just let your mind wander. It will not be difficult for you to find every day a new exciting space for your towel and your umbrella along the Gulf of Mexico. You will relax perfectly. (Englewood Beach, Manasota Beach, Venice Beach, Boca Grande, Palm island) Whether you do a morning walk along the beach, glide thru Lemon Bay in a kayak, collect shells, watch the game of the dolphins or enjoy the unforgettable sunsets - Southwest Florida is a paradise for nature lovers. More Highlights: Walt Disney, Sea World, Universal Studios, Busch Gardens and Kennedy Space Center, Everglades. Come and see with your own eyes. Golf: Only 0.2 miles from the nearest golf course. The friends of the little white ball will find themselves in Golf Heaven. 25 championship golf courses, within 20 minutes, with green fees pleasantly low all played without handicap requirements. Tennis and Golf are the most popular sports in our area. Countless places await you. After a warm sunny day at the beach, on the golf course or on a boat, you and your family will enjoy a sunset dinner in one of our local restaurants. The diversity is huge. It ranges from Italian, French to American cuisine. Seafood, wonderful juicy steaks with crisp salads and fine wines can be found in the restaurants along the beach and all over our peninsula. Some of our restaurants are basic 'Tiki Huts' next to the Bay – others are High Class. Friday and Saturday is party time with live music - bands from various genres are playing for your entertainment. You will find a gourmet guide in all of our Rentals. Bitte beachten Sie: unsere Preise sind Endpreise! Keine versteckten Kosten. Im Preis inklusive sind Strom, Wasser, Poolservice, Gärtner, Klimaanlage, Bettwäsche und Handtücher und eine deutsch/englischsprachige Betreuung vor Ort, ebenfalls inklusive sind 12% Steuer des Staates Florida (genannt Tourist Tax, zusammengesetzt wie folgt: (5% County/ 7% State). Die Kontaktadresse und Telefonnummer, der deutschsprachigen Betreuerin in Florida, wird Ihnen mit dem Mietvertrag zugestellt. Die Endreinigung über $ 135.— ist im Preis inbegriffen. Die Sicherheitskaution (rückerstattbar) beträgt US$ 500.--. Die Villa kann am Anreisetag frühestens um 16:00 Uhr bezogen werden. Am Abreisetag ist spätestens um 10:00 Uhr check–out. Im Haus ist Rauchverbot. Auf der Terrasse ist das Rauchen gestattet.